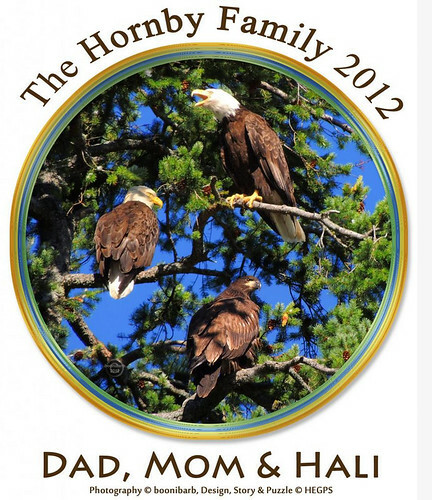 Hali is Mom and Dad Hornby's 2012 eaglet. We hope that many students and adults will enjoy and do the activities, courtesy of the HEGPS team. All three are perched in the Mom and Dad Hornby's Baby-sitting Tree! Hali was ready to fly! She fledged (flew from the nest) several days after this photo was taken! How did Hali arrive in this spot? Hali, a name that comes from her species’ name Haliaeetus leucocephalus (hali = sea, aeetus = eagle, leuco = white, cephalus = head) is a Bald Eagle. Bald Eagles are a type of sea eagle found in North America. Just about three months before, she was but an egg, still to join the world. Her parents had created a perfect place for an egg to be laid and cared for. They had a nest in a tall fir tree that they had built and maintained for many years. It was a good nest, about 8 feet wide, near the top of the tree, on Hornby Island, British Columbia Canada. The nest was built of sticks and twigs and lined with mosses and grasses. Hali’s parents continually worked on the nest bowl to make it just right to brood an egg. They often had comical looking “discussions” about just where each twig and grass should be placed. Hali’s mom and dad were a long-bonded pair and showed their devotion to one another. They were well suited to parenting. A strong bond is important for raising eaglets as a team. Before Hali was an egg, her parents protected their nest and spent time together in their territory. Their territory was a fine one! 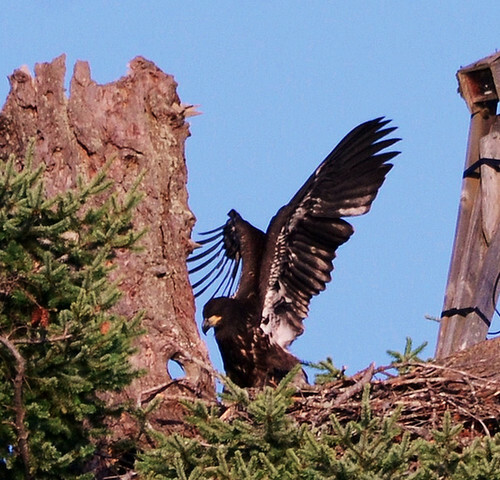 The environment was very good for raising an eaglet. Along with the nest tree, the parents spent much of their time in a nearby tree with a fine view of their nest. In addition to a view of the nest, the tree gave them a place to defend their realm, preen, rest, and spend time together. They could also see the nearby ocean where most of their food could be found. They had several other favorite trees which provided wonderful perching spots. Eventually Hali’s mom laid the egg from which Hali would emerge, a little more than a month later. Hali’s parents were amazing! They took turns keeping Hali’s egg home warm and covered. They even used their beaks to turn her to make sure she would develop properly! At night, Hali’s dad would sit on the nearby tree watching over Hali and her mom. After about a month, Hali started making noises inside her egg. Her parents talked to her and could hear her peep! Before long, they saw a small hole, or “pip”, in the egg, which Hali made using her egg tooth. She had started her way out of her egg to take her place in the nest as a chick. Hali worked hard to get out of her egg shell. She pecked for several hours before she was free. She looked around and saw her wonderful nest home and her proud parents. Her mother began to nestle Hali and keep her warm, using her soft feathers. Her father brought a fish to mom for Hali’s first meal. Mom, with her big sharp beak, was able to cut the fish into tiny little pieces just the right size for Hali. She tenderly fed Hali, who was so small she had come out of an egg the size of a baseball! Mom, on the other hand, was very large. She was over three feet tall and with a wingspan as big as a man is tall! Yet she was tender and careful as she fed and nestled with Hali. Dad trilled his pleasure to all in his territory! Hali has arrived! Hali’s days as a nestling were made up of feedings and tender care from her parents. Despite their large size and long sharp talons, her parents were always careful and gentle in the nest with Hali. They took turns staying with her to keep her safe and protected. Hali grew rapidly and was happy and content, often communicating with her parents. As she grew, she learned to tell her parents quite often “feed me now, I am hungry”! Her communications became louder and more demanding, but they did not bother her parents one bit. 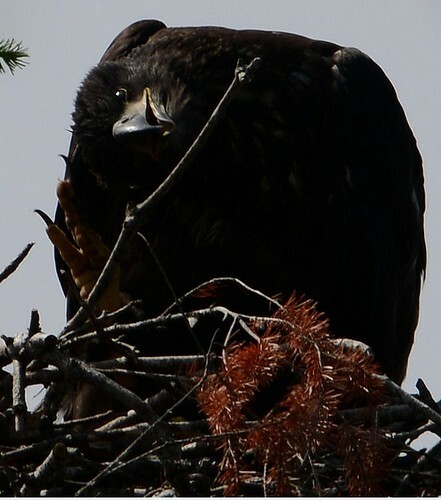 Her pleas for food meant she was growing and developing into a fine eaglet. Hali was well fed and did not have to squabble with a sibling over her meals. Dad often brought Hali and Mom various types (species) of fish, including salmon, herring, or a Midshipman, depending what was in the sea water near the nest. A few times her parents even fed her pieces of an opossum! After Mom or Dad put food into her beak, it went down into her crop. After a time, the waste came out as poop! All of this good food helped Hali continue her growth and development. After awhile, Hali began to become a little more independent, learning to stand and walk on her own; all the while still close to mom or dad in the nest. She learned to open and flex her wings. This was very important for her to do if she wished someday to fly. She built up her flight muscles with her exercising with each flap, and before long was flapping many times a day. She learned to preen her feathers and her appetite continued to grow as well! 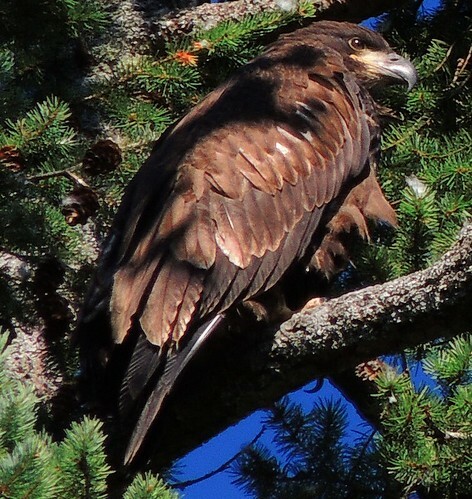 Her parents were able to nourish her several times a day, since they had a territory that provided the food needed for a growing eaglet. After several weeks, Hali was able to flap her wings very well. Soon she found she could propel herself slightly off the ground! She showed her parents her special skill of “fleaping”, a combination of her flapping and leaping. Now she was fleaping all about the nest, even venturing near the edge. She had grown so much since she was a hatchling that her nest bowl now did not seem as deep, and she could explore her home tree. Hali was so excited when she learned to fleap to a nest tree branch outside the nest edge. She had accomplished an important step in her development, called “branching”. She found she could branch and perch for long periods, just like her mom and dad; taking stock of her surroundings. Her parents left her alone for some time now in the tree, letting her branch so she could explore and learn about her home. They continued to bring her food and spend time with her as well. It would not be long now before Hali would be ready to fly. When a bird flies from the nest for the first time, it is called “fledging”. Hali was getting close to fledging as she practiced her fleaping and flapping. When the wind was just right, she even began to feel air under her wings! Once she surprised herself when she found herself three feet above the nest! "However did I do that? ", she wondered! When Hali was nearly three months old, she learned to fly up to a higher spot in her nest tree. From there she felt like she was on top of the world and she could see forever! Her parents watched from the nearby tree, babysitting from just a short distance away as always. 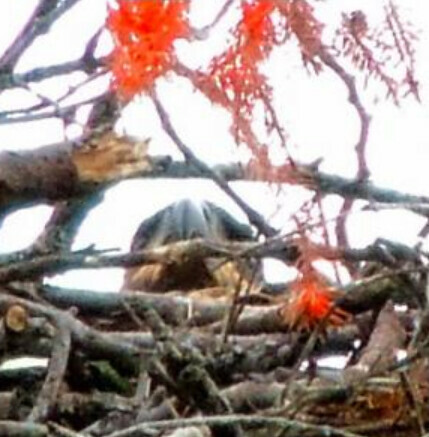 One day Hali’s mom perched on a special branch that was in a direct line from the top of the nest tree. She was showing Hali a place to land on her first flight! Would Hali understand? Would Hali make the flight? It was a daunting task and she would need to trust in herself and in all her parents had done to prepare her for fledging. Hali flew!! She had left her nest and was now a fledgling! She may have been a little shaky, but Hali made it to the spot that her mom had showed her the day before! What would she do next? It was a good thing she was strong and healthy and able to perch and take everything in. Next would be if she could make it back to the nest. After a few hours, Hali did just that! Over the next few weeks Hali learned to take off and land gracefully; quite an improvement over her first flight. She spent time with her mom and dad learning which trees to use to perch and rest. She learned where to go to watch the water to look for food. Her parents continued feeding her, but also were teaching her how to find and keep food of her own. Soon Hali would be able to take care of herself! Hali would soon be on her own. Her parents had done their job of preparing her for adulthood. She would find other immature eagles with whom to spend time as she continued to mature. She would learn to deal with competition for food. 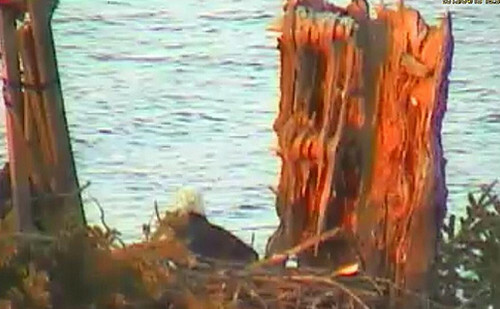 It would take five years for her to develop the coloring of an adult Bald Eagle with its distinct white head. 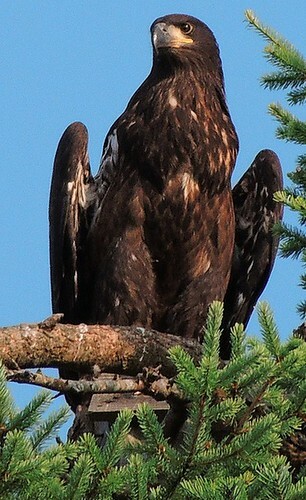 She would then be ready to find a mate, build a nest and raise eaglets of her own. She would always be grateful for the lessons and care she got from her parents. And she will never forget the day she took her exciting first flight. We encourage you to expand and enrich your students' experience with this project by teaching a Geography lesson, using maps of British Columbia and North America. Please include the ©2013 HEGPS citations. Wow Thank you Tigerlady!! what fun for all! Very nice, beautiful eaglet, nice story and a fun word search. Thank you all, on behalf of our wonderful HEGPS team! 1. Note: You can change the number and shape of the puzzle by clicking on the above link and then clicking on "Change Cut" on the menu on the left. Suggested cut to do first is either "48 Classic" or "67 Classic." 2. Students: If you want to change the number of pieces or shapes in the puzzle, please ask your teacher how to do it. Thank you Tigerlady! This is great fun!